Good afternoon everyone. 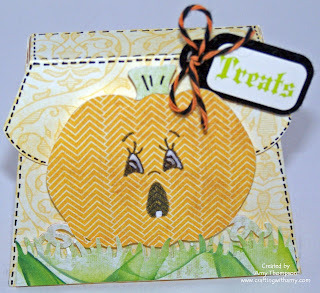 Thanks for stopping by today to check out my Happy Pumpkin Treat Box. This box was cut out using the Bags, Tags, Boxes & More Cricut cartridge and the pumpkin was cut out from Paper Doll Dress-Up cartridge. I used some of my favorite DCWV paper stack called The Ghosts & Goblins stack. I love this stack. 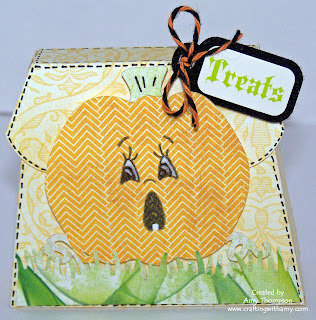 The face I used on the Pumpkin is from Peachy Keen stamps called Pumpkin Faces. I used my black pen and did some faux stitching and colored in the whites of the eyes then put some glossy accents on the eyes. Then I used my Martha Stewart Punch and punched out some grass twice and used some foam tape to pop up the front one. Then I used some pop dots on the pumpkin and made sure that when it closes it goes between the two pieces of grass. The little "treats" tag is from DCWV The Ghosts & Goblins embellishment stack and the baker's twine is from My Craft Spot. Thank you for stopping by today. I hope you enjoyed my treat box. Don't forget to check out this weeks giveaway here and this month's giveaway here. Very sweet pumpkin treat box. Thanks for playing the Box it Up Challenge this week at Peachy Keen Stamps. this is super cute !!! love the twine too !!! Thanks so much for joining us at Peachy Keen this week !!! Just adorable, Amy!!! Great colors and I love the stitching. Super job!! This is adorable Amy. Love the little purse and the face is so cute. Great stitching detail. Thanks for joining LSP this week. Super Duper Cute Purse! !Love it!